Sounding Mantras is a structural way of using toning. Mantras are sets of sound patterns, coded with a particular thought-forms, and the feeling states they are meant to elicit. The code in mantras is a compressed knowing, downloaded directly from the Divine Mind of the Universe. Although the term “mantra” is from India, most ancient cultures had some sound codes like that, and they usually imbedded them in the names of their holy beings, places, and sensory states. Even letters themselves can be mantras, if they are of high enough frequency to hold an entire program. Mantras are not just heard, mantras are meant to be experienced. They are a full program, i.e. they are meant to realign the entire energy system, all of the energy bodies. And so sounding and hearing a mantra is meant to be a full system experience – only then will it have the full potential of opening the knowing. Unfortunately most people still only tune into the mantras through their mental level alone (which really has no good result at all), or through their emotional body only (which has a result of “feeling great”, but does absolutely nothing for the Divine Mind conscious activation). All true mantras are related to Spirit. 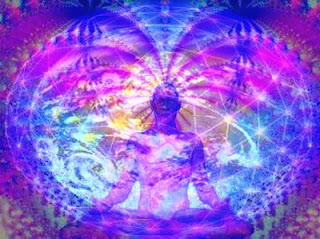 They resonate one way of the other with “Spirit is All That Is”, and the converse proposition that "All That Is is Spirit"; and since a human being is included in the “all”, we are resonating with the original description of a human being as the “likeness of God”, which represents the fractal of the Universal hologram of Spirit. “Kadoish, Kadoish, Kadoish, Adonai Tseybeyoth” is a very powerful mantra because it represent the ascension process of this Universe. The syllables are sound-codes. Kadoish means holy , Adonai means the Master (often mistranslated as Lord), and Tseybeyoth (Sabaoth for Gnostics in Coptic Christianity) is the name of the forces opposite to the Yaldeboath, who is the arrogant creator, attempting to override Spirit, while Sabaoth represents the harmonious-with-spirit-creation. It is often translated as “Holy, Holy, Holy Lord’s Armies” and used as a protection mantra (it does resonate with the highest Light and so does repel anything of disharmony), although the more balanced way of looking at it would probably be “Sacred Master of force of Light”. This mantra is Ugaritic-Sumerian-Hebrew in origin, one of the most ancient mantras. It is the Code for the Universal Hologram, which synchronizes oneself with the Divine Mind. Sounding this mantra must be done three times in a row for the best effect. It unifies both hemispheres of the brain and facilitates clarity, focus and discernment. Here is a link to a video where this mantra is beautifully (and in proper tone!) sung by this woman Amira Solmaia: http://youtu.be/cl6HFyejtsA (the link should work as is, if not - copy and paste it onto your browser).